I have not enabled Hyper V or hardware acceleration and don't want to either. emulator: ERROR: x86 emulation currently requires hardware acceleration! Please ensure Intel HAXM is properly installed and usable. CPU acceleration status: HAX kernel module is not installed! How do you test on android in such cases ? In current AVD manager you can't. You just have the opportunity to use ARM images which will not need hardware virtualization. Choose arm* instead of x86/x64. Although this is the available solution but still a slow one !! The only way I got this working again was to downgrade the SDK tools to V22.3 from here: http://dl-ssl.google.com/android/repository/tools_r22.3-windows.zip and to buld an AVD using a downgraded system image, for instance https://dl-ssl.google.com/android/repository/sys-img/android/sysimg_x86-17_r02.zip. (So this is no help if you need to test on more recent versions of Android). Google have moved on to an updated version of their emulator based on a more recent version of qemu, and provide binaries for arm and mips emulators, but have omitted to ship the x86 equivalent (there is no emulator-ranchu-x86.exe and emulator64-ranchu-x86.exe). If they did so, or if someone else went to the trouble of setting up and compiling their emulator source with the "x86" flag on, then _x86 soft emulation could conceivably be made to work again. Short Answer: No. Until recently(about 1 month ago), you could do that but with the latest updates, it is not possible. (see Update to Android SDK Tools 23.0.5 and avd doesn't start). I was doing something similar: Doing development in a virtual machine and hence couldn't use the Hardware acceleration features as they are available only in the host machine. I was using Intel x86 images with Use Host GPU option; as they were much faster than the ARM version even without hardware acceleration. But then, after this update, my emulator AVDs which were working earlier are no longer starting with the same exact error message. Also, both genymotion and Xamarin Android emulators can't be used as they also need hardware acceleration(they are actually VMs which use Hardware acceleration for speed, and hence can't be run inside another VM). I have found this solution but haven't tried it yet. The basic idea is that to still develop inside a VM; but for testing connect to an Emulator running on the host machine(and this Emulator VM can now use the hardware acceleration feature). 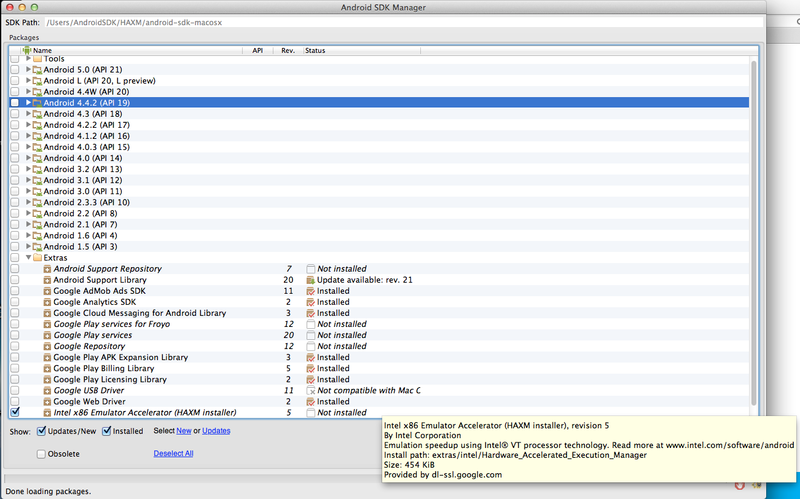 Start the Android SDK Manager, select Extras and then select Intel Hardware Accelerated Execution Manager. The usage of the Hardware acceleration depends on the System Image you choose on the emulator. Go to AVD manager, create virtual device, select hardware, click next. Note: for other systems that require HAXM, there no way to run them without hardware acceleration. To connect bluestack to android studio. Run adb connect localhost:5555 from this location. Start Android Studio and you will get Blue Stack as emulator when you run your app. Not with the standard Android SDK emulator, as it requires Intel's HAXM, and HAXM wants virtualization extensions to be enabled. Whether Genymotion or something else from another independent developer can support your desired combination, I cannot say. My PC does not support vt-x, I can not use android studio 1.0.2.
yes is possible to run your android emulator without have a hardware accelerator. In fact to do that, you need to open your android virtual device. When you reached to system image configure, it suggest you which version of android image you want to use. Whatever version of android system image that you select,you need to make sure that,ABI is armeabi-v7a and, you target is System image ameabi-v7a with google APIs. And then complete the rest of task and check out your emulator. You need "VT-x supported processor" at least to run Android emulator with Hardware acceleration. If you have enabled or installed "Hyper-V" in your windows 8 then please remove it and disable the "Hyper threading" and enable "Virtualization". When Run 'app' (green triangle): In Device Chooser select Launch emulator and click the button [...] Rigth click on Nexus (or other) click on Duplicate In the O.S. (Android 6.0 example) click change: Clic on Show downloadable system images. Look for armeabi-v7a O.S. and click download. Set this O.S. in the device. Finish, and choose this Device for the emulation. Not the answer you're looking for? Browse other questions tagged android android-emulator android-studio or ask your own question. How slow is slow when it comes to the android emulator?